It all started in February last year, whilst finishing my Master’s at Oxford. After a few drinks at the pub with a friend, we started discussing an idea of doing something crazy before we stare down the barrel of a career. After some suggestions, we came up with the idea of rowing across the Atlantic Ocean. A great idea. Whilst most of these suggestions get left at the pub until another day, I was contacted by my friend the next day saying that he was in. Little did we know what we were letting ourselves in for. Considering most campaigns of this nature take between 1.5 and 2 years, it was always going to be a busy 9 months. We spent endless days at the back of lecture theatres creating and editing our website (www.theoardinaryboys.com), as well as formulating sponsorship packages to send to companies. Indeed, the first hurdle was the struggle to obtain sponsorship to get to the start line. A campaign of this magnitude costs over £60,000. Turning from student to business professional fresh from university was difficult indeed. In this respect, we are really thankful for WHIreland for their support throughout. How do you train for something like this? Well, the short answer is that there is no real firm answer. Not enough people have done this for there to be a fixed training routine. In fact, as it stands, more people have been to space than have rowed the Atlantic (roughly 500). However, my training revolved around strength and flexibility, with a lot of lifting weights. During the row, I lost 12.5 kg (or over 2 stone), and so gaining weight was really really important. We also trained a lot in the boat, rowing in the North Sea and the Solent. In November, our boat was shipped off to the Canary Islands, where we were to start the race. Looking out the window, as we flew over the Atlantic, we realised the scale of the undertaking we were about to attempt. We had two weeks of preparing the boat and meeting the other teams in the race. And then, just like that, we were off on December 14th. The first few days were magical. Perfect conditions, dolphins at sunrise, and magical stars. We were slowly adjusting to sleeping less than an hour and a half at a time, and were making good progress. Quickly, though, our lives were turned upside down – literally. A massive tropical storm was forecast to come our way. The next few days were filled with a sense of dread and foreboding as the wind and waves steadily increased. It was bitterly cold at night, and our little boat would get knocked all over the place. Indeed, we were capsized 3 times at night during this storm. Whilst we were harnessed to the boat, it is quite a shock being dunked into the water and having to swim back to the boat. Everything was wet, even inside the cabin, and was to remain so for the duration of the race. Whilst these moments were the hardest of the trip, we didn’t appreciate how close we were to a life threatening situation. Indeed, we found out later on that 4 boats were rescued by passing container ships, and 1 crew had been in a liferaft for 16 hours in those horrible conditions. Even in the good weather, the daily grind was immense. As the days and weeks wore on, our bodies and minds started to break down. We struggled to eat the 6000 calories we needed – and we had to ration our water when our watermaker failed. Mentally, it was incredibly difficult seeing how little progress we would make each day (60-80 miles) compared to the scale of the challenge. The joy of hearing the watermaker start, and the great feeling of satisfaction at the end of a good rowing shift was awesome. Further, the wildlife we saw was immense. We were followed by a pod of 5 pilot whales that came within 10 feet of the boat, and one time were greeted by the sound of a huge humpback whale surfacing just next to us. We continued on past Christmas, New Year and birthdays. Soon, we realised that we were under the world record time for a pairs Atlantic crossing, just behind one other boat – Row2Recovery. The race was on, and relentless. The last week was spent battling it out, within 3 miles of this other boat, for first place. We rowed together for hours at a time, and were neck and neck with the other team. However, on the final night, our bodies gave out after 36 days of battling the elements, and we eased off and enjoyed the last day rowing into Antigua. Seeing land for the first time was incredible. Almost a mirage at first, that eventually became larger, and started to become green. Then houses started to appear, and finally the Antigua Search and Rescue boat came to greet us. The last stretch was accompanied by a small flotilla, and finally we crossed the finish line at English Harbour after 37 days and 12 hours at sea. 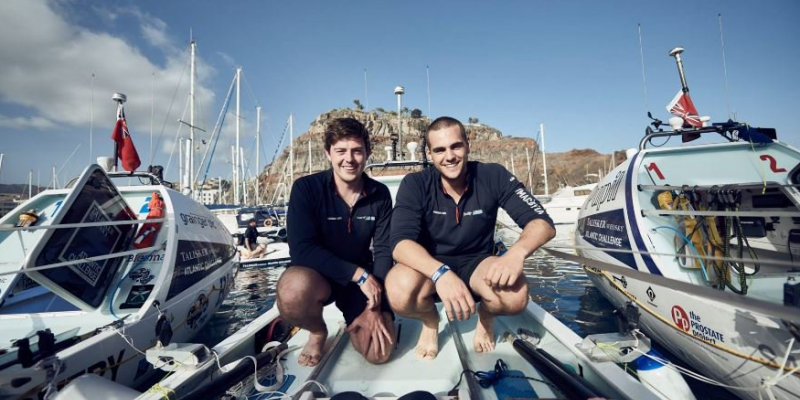 We are the second fastest pairs team to have rowed the Atlantic. These surreal moments will stay with us forever. Stepping off the boat was a challenge in itself, and we stumbled around Antigua like village drunkards for the next few days. Having had the time to appreciate what we had achieved, I now realise how lucky we were to have been given the opportunity to take on such a challenge. Thanks must go to all of our sponsors and people that helped along the way. We are really proud to have raised over £60,000 for Alzheimer’s Research UK and The Against Malaria Foundation. We are giving a number of lectures about the campaign, in aid of these charities, over the next few months. The next challenge is starting a career! Thanks once again to WHIreland for being part of this incredible journey. If you wish to donate to The Oardinary Boys’ chosen charities, The Against Malaria Foundation, and Alzheimer’s Research UK, please click here.